Although this Pulitzer-winning play is about extremely complicated math, its characters are even more complicated. Proof, written by David Auburn, is about a young woman named Catherine, the younger daughter of a brilliant mathematician who recently passed away. Catherine inherited his genius, but she is also worried that she inherited the mental illness that made the last years of his life so difficult. Catherine has to prove herself to Claire, her older sister, and Hal, one of her father’s PhD students. Claire doesn’t believe Catherine can take care of herself, even though Catherine took care of their father when Claire moved away. Hal doesn’t believe that Catherine is capable of advanced mathematics because she never finished college, even though Catherine spent a long time learning from her father. I’ve created three outfits based on three of the characters. Keep reading to see them all! Jesus, you mathematicians: You don’t think. You don’t know what you’re doing. You stagger around creating these catastrophes and it’s people like me who end up flying in to clean them up. Claire tries to convince Catherine to move to New York City by telling her about her cosmopolitan lifestyle. Capture Claire’s sense of style by layering a long white vest over a fun printed dress. Add on-trend lace up heels, classy sunglasses, and a reusable tote bag that references Claire’s new home. Even before I knew you, I’d catch glimpses of you when you visited your dad’s office at school. I wanted to talk to you but I thought, No, you do not flirt with your doctoral adviser’s daughter. Hal tries to impress Catherine by inviting her to see his math-themed band play. They have a song called “Imaginary Numbers”—it doesn’t exist. This silly graphic t-shirt expresses Hal’s math-based sense of humor. For a cool-professor vibe, add light wash jeans, a camel brown cardigan, and classic black Vans. You think you’ve figured something out? You run over here so pleased with yourself because you changed your mind. Now you’re certain. You’re so…sloppy. You don’t know anything. Catherine is a force to be reckoned with. 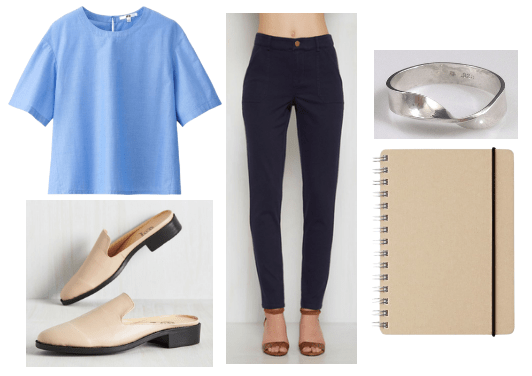 Get her understated, casual look with navy twill pants, a boxy light blue top, and comfortable beige mules. Allude to her mathematical genius with a pendant shaped like a mobius strip, and keep a notebook on hand to work out your brilliant ideas. Proof explores the mathematics that make up a family: additions and subtractions of people, measurements of love, equations of inheritance. It’s the most beautiful thing I’ve ever read about math. Have you seen a production of Proof? Are there any plays or musicals you would love to see covered in this column? Let us know what you think in the comments below!